THERE ARE MANY GROUNDBREAKING therapies and treatments for all different types of cancer. However, access to that new treatment is not always the same for all patients with the disease. Patients who live in more rural areas, far away from major cancer centers, or who may not be able to afford a commercial airline ticket often feel as if they are out of options. They may not seek a second opinion from some of the country’s leading experts in cancer or enroll in a clinical trial that could add years to their life. Corporate Angel Network (CAN) is trying to break this barrier. The charitable organization was created 35 years ago by Pat Blum, a female pilot, who developed breast cancer. After realizing that she did so well and survived because she was near a major cancer center in New York City, she decided she needed to leverage the same treatment for other patients. With the help of two other individuals CAN was established, and has since flown more than 53,000 flights, helping patients with cancer and bone marrow transplant patients get access to the health care that they need. 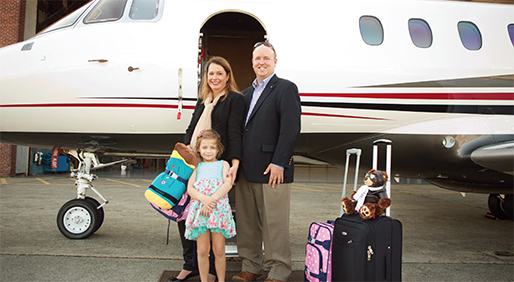 “Our mission is to get patients the best possible care and we use corporate jets as a mode of transportation to get them there,” Gina Russo, executive director, said in an interview with CURE®. Every year, about 3,000 to 3,500 corporate jets take off with patients of all ages. Five hundred major corporations, including nearly half of the Fortune 100, participate by allowing those patients, along with one companion — or two, in the case of a child — to use their empty seats, often accompanying company executives. The service is free and there are no limits on the number of trips one patient can be given. CAN has made the set-up process easy. Russo explained that patients can call, provide a date of their appointment and the flight coordinator takes care of everything else. CAN does require a medical verification from a physician who has seen the patient within the last 30 days, and it also confirms that they are going to a treatment center. Patients must also be to walk up the steps of the jet, not be on an IV and not be on oxygen. “If someone is interested in getting a second opinion or enrolling in a clinical trial, which is often the best treatment option for most cancers, they should not let travel be the barrier that prevents them from doing so. Let us help,” she said. In the case of Ava, a two-time cancer survivor at the age of eight, she used CAN’s services at least 12 times for treatment at Memorial Sloan Kettering Cancer Center (MSK) in New York City. She was diagnosed with stage 4 neuroblastoma, a rare childhood cancer, in 2012. Her left adrenal gland had a tumor the size of a grapefruit. Following treatment in Miami in 2013, she was considered to have no evidence of disease. Two years later, a spot was found during a routine scan. That’s when her parents decided to take her to MSK to work with leading experts in neuroblastoma. “The comfort I had as a parent knowing that my child could fly in a clean environment, when her immune system was suppressed from treatment, was priceless,” said Nickelle, Ava’s mother. Ava had scans in May and is currently doing well. For more information about CAN visit, www.corpangelnetwork.org/index.htm, or call, 866-328-1313.